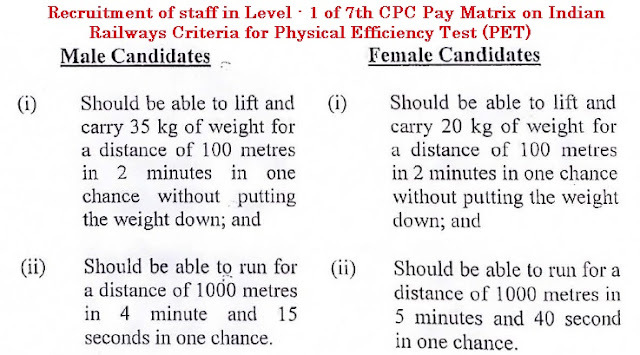 Sub: Recruitment of staff in Level - 1 of 7th CPC Pay Matrix on Indian Railways Criteria for Physical Efficiency Test (PET) regarding. Ref: This office letter No. E(NG)II/2012/RR-l/14 dated 12.11.2012 (RBE No. 126/2012). Attention is invited to Board’s letter under reference prescribing criteria for Physical Efficiency Test (PET) for recruitment of staff for all categories in Level - l of 7 CPC Pay Matrix (earlier Grade Pay 1800/-) on Indian Railways. Should be able to run for a distance 1000 metres in 4 minute and 15 seconds in one chance. Should be able to run for a distance of 1000 metres in 5 minutes and 40 second in one chance. 3. The above norms will be applicable in all future recruitment from open market in Level-1 Notification, If any, issued may please be amended suitably by issuing a corrigendum.